Synopsis: A surreal French horror classic: A doctor uses the skin of women he abducts to construct a new face for his disfigured daughter. Publicly, the brilliant Dr. Génessier (Pierre Brasseur) mourns his daughter Christiane (Edith Scob), who is missing and presumed dead. In actuality, she suffered a disfiguring injury in a car accident and now wears a mask to hide what’s left of her face. Her father hides her away in his remote country mansion, which is also the site of his surgical practice. His assistant Louise (Alida Valli of “The Third Man” fame), lures women to the house, where they are drugged and the skin of their faces removed, all in the hopes of giving Christiane a new face, but each graft has failed so far. The sensitive Christiane, who is a prisoner almost as much as the dogs, likes to visit the dogs and comfort them briefly. After telling Louise she wants to die and no longer wants any surgeries, she helps the latest victim escape before another grisly operation can be performed. 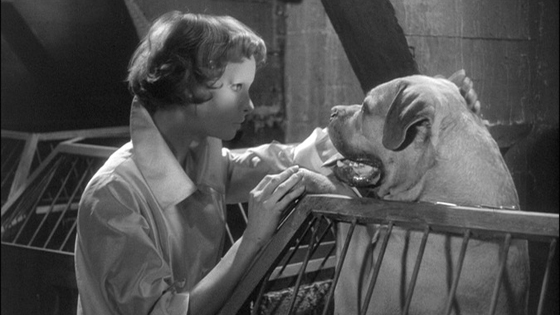 She also releases all the dogs, who immediately attack her father, destroying his face and killing him. 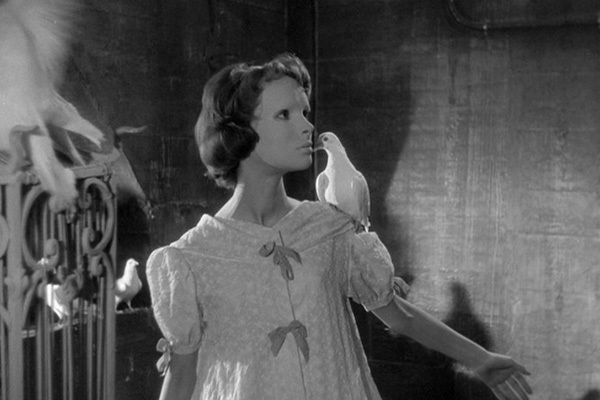 In the film’s poetic last images, she also frees the caged doves and walks with them into the woods.